The Moonrakers were the most popular group in Denver during the mid 1960s, with four singles hitting the local charts (the biggest being “You’ll Come Back”). But Joel Brandes, Denny Flannigan, Bob MacVittie, Bob Webber and Veeder Van Dorn couldn’t break out nationally. After several membership changes, the Moonrakers returned in 1969 with the Christian rock album Together with Him. The drummer on half the songs was Jerry Corbetta, who as a teenager had played keyboards in the Half Dozen’t and the Brambles. Corbetta returned to keyboards, and with Bob Raymond (bass) and Myron Pollock (drums), the band transformed into Chocolate Hair. The quartet, scoring a big national hit with “Green-Eyed Lady,” which peaked at #3 on October 17, 1970. “The Moonrakers and the Half Dozen’t were seasoned bands. Musicians were lucky—Denver had nightclubs where you could drink 3.2 beer when you were 18. We played six nights a week for years. I had a Corvette bought and paid for before I could drive. You honed your chops—you could play the songs in your sleep, with a shower or without a shower,” Corbetta said. “Bob Webber was the Moonrakers’ guitarist, and he and I were fire and ice personality-wise. He’s a real linear thinker—an aerospace engineer, 4.0 student. I was Italian, from North Denver—I played the accordion. Chocolate Hair recorded a seven-song demo that got the quartet signed to Liberty Records. There was also a name change. The band took the name of a mountain summit in the foothills above Boulder where Webber lived, transforming into Sugarloaf. The demo, a mix of rock, R&B and jazz licks, became the basis for the debut LP, but only after new drummer Bob MacVittie came on board to record the last song for the album, which scored the band a big national hit—“Green-Eyed Lady” peaked at #3 in October 1970. “We went out to Hollywood to record, but the record company said the demo was going to be our first album—don’t make waves. I said we needed one more song. I thought I’d write better if I knew we were doing it for real. Corbetta’s organ solo in “Green-Eyed Lady” is regarded as a classic. Non-stop touring gave the band little time for songwriting, so they invited Robert Yeazel from the Colorado band Beast to join on guitar and vocals. An edit of his “Tongue in Cheek,” a track on the second Sugarloaf album, Spaceship Earth, became a minor hit in 1971. In trying to regain a recording deal, Corbetta was spurned rather imperiously, which resulted in an amusing song about the fickle music industry. 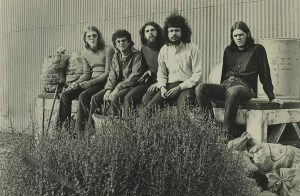 Recorded with initial drummer Pollock back in the fold, the dance-friendly new track spelled out the CBS Records phone number and a general White House number—touch-tone style—for the world. “Don’t Call Us, We’ll Call You” by Jerry Corbetta/Sugarloaf peaked at #9 in March 1975. But the band quickly dropped from sight anyway. Life after Sugarloaf was artistically lucrative for Corbetta. He co-wrote the Grace Jones hit “On Your Knees” and the Peabo Bryson/Roberta Flack number “You’re Looking Like Love to Me.” He also was asked to join the Four Seasons for their 20th Anniversary Tour and continued to write, perform and tour as a full member for four years. He toured with the Classic Rock All-Stars until retirement; he passed away in September 2016.